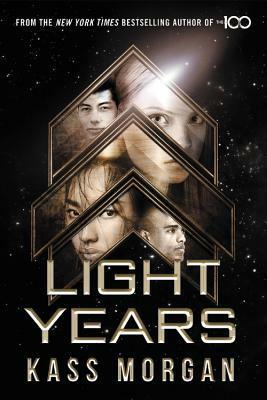 Light Years has been on my radar for a little while and I was so happy to receive a review copy from The NOVL for review! I loved reading Morgan's previous novels, and I was hoping her newest novel would be equally as addicting. I most certainly wasn't let down with Light Years! It was fast paced and fun, and the characters were really entertaining! There wasn't really too much that made this novel special or stand out, but it was entertaining and held my attention from start to finish. The world building and characters in this novel were probably my favorite two features. I thought Kass did a really great job of incorporating diverse characters in a natural way. Sometimes I think authors are so interested in making sure they have diverse characters that it almost feels forced. I never felt that way with the characters in this novel and I thought they all flowed together really nicely. All in all, Light Years was a really fun and quick read and I would highly recommend it to readers who enjoy Sci-Fi YA novels. Thank you to The NOVL for sending me a copy in exchange for an honest review!